Obituary for Venkata Narayanamma Banda | Esterdahl Mortuary and Crematory, Ltd.
Smt. 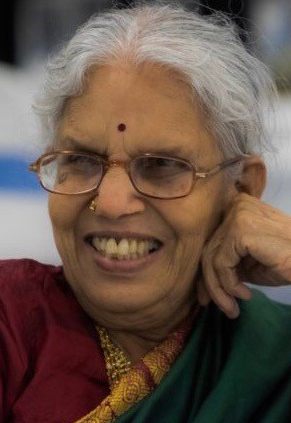 Venkata Narayanamma Banda (Hari Banda’s mother), age 80, wife of Late Venkateswara Rao Banda, Bettendorf, Iowa, passed away on Thursday November 8, 2018 at University of Iowa Hospitals & Clinics. A Visitation will be from 1 PM to 2:30 PM, with a priest services begin at 2:30 PM on Saturday, November 10, 2018, at Esterdahl Mortuary & Crematory, 6601 38th Avenue, Moline, IL 61265. Cremation rites will follow services. Family, friends, and all community members are invited. Smt. Narayanamma was a very active, happy, loving person and always smiles. Community really misses her. She is survived by her sons, Srinivas and Hari; daughters, Vijaya and Padma; daughters-in-law, Katyayani and Raji Banda; sons-in-law, Ramaraju and K.V.L.N. Rao; grand kids, Kiran, Gayatri, Malavika, Bhargava, Rohit, Ramya, Teja; and family members.